Happy Flash Friday everyone, today we’re going to be talking about Flash related objects that are in some way lighted. So, yeah, Flash Lights. Before I get started though, I know there are a number of people who just come here for the Flash articles. I wanted to point out that Sunday marks the one year anniversary of That F’ing Monkey. I laugh that after a year I’ve shown off the majority of my Flash collection, but I’m sure I’ll be able to keep Flash Friday going strong for a long time. There will be an extremely important site update tomorrow that I hope you’ll check out. Then on Sunday there will be a review of our first year. With that out of the way, we can get to the Flash talk. The first item is my Flash neon sign. DC put out a series of neon lights around two years ago now. They were called mini-neons; the symbol measures 8” wide and 9” high while the base measures 5.5” in diameter. 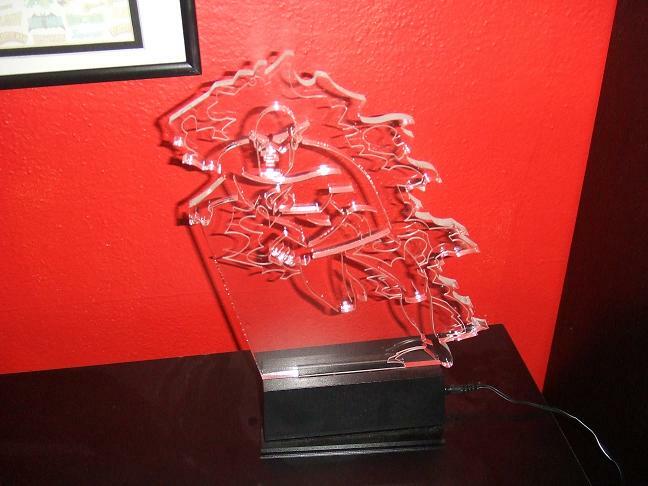 It comes with a bracket that lets you either mount it on a wall like in the picture above or use the base as a stand. 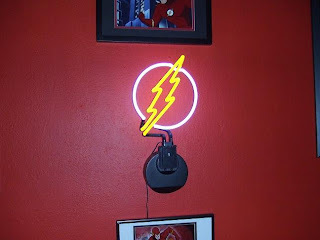 I was tempted to keep it free standing and place it on top of a display case, but in the end I made it the center piece to my Flash wall. 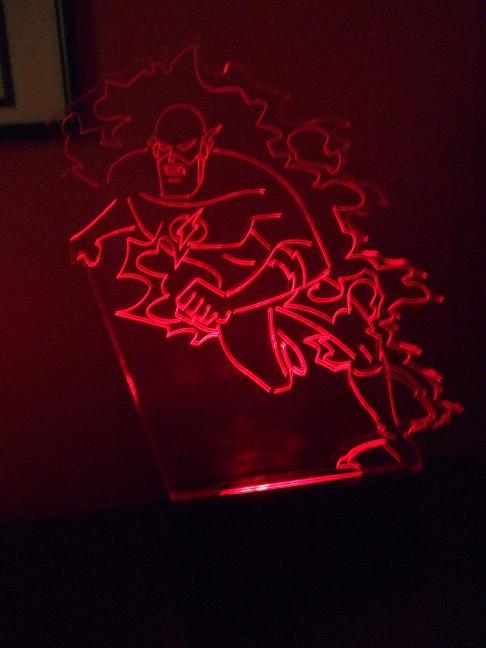 The next piece is one of my favorite things in my Flash collection. Do you remember the Warner Brothers stores? Just near the end of their run they really started pushing stuff for superheroes other than Batman, Superman, and Wonder Woman. One of the last items I got was the cut glass lighted display you see above. The first picture isn’t a good representation of the piece, but I wanted to show you it lit and unlit. The glass piece doesn’t feel fragile, so it is probably a kind of plastic instead of glass. The base houses a small red light that shines up into the glass portion. As you can see in the picture, it makes a pretty impressive looking piece. You can tell when this was produced by the design; it is very similar to the Justice League version of Wally but looks just a little bit thicker. This came out not long after the Flash’s appearance on the Superman cartoon. After all these years the base has gotten pretty beat up, the bottom of it is starting to peel away. At some point I’m going to have to find a way to replace it. I don’t actually own this last item. The night lights just came out a few months ago. I’ll pick one up eventually, but you can only have so many night lights and I already have a blue canary. I am sorry I don’t have an actual Flash, flash light to show everyone. Maybe I’ll get bored one day and customize one. One last note on the neon, I've seen them on a lot of websites at clearance price. So if you're looking for one, it might be a good time to pick it up. 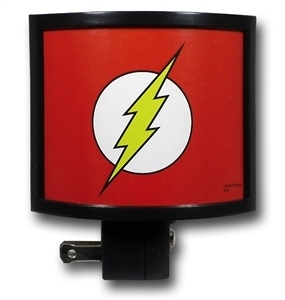 That’s it for this Flash Friday, remember that this weekend we’ll have some exciting stuff happening so check it out. That glass display is really cool! Also, congratulations on the one-year anniversary!